The drink is so popular it is often thought of as the number two English drink, tea of course being the first. 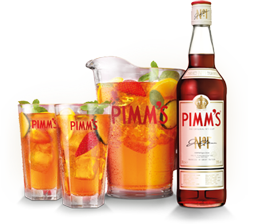 The original Pimm’s No.1. was made using gin, quinine and a secret mixture of herbs as an aid to digestion. Recipe for Traditional Pimm’s No.1. English cocktail may also be considered a liqueur, need Pimm’s – 1 part, lemonade – 3 part, add lemon slices, orange slices, fresh mint leaves, fine cucumber slices, strawberries, hulled and cut into quarters (all or some depending on what you prefer) and pour into a glass half filled with ice, lightly stir and serve. For an alternative to lemonade, try ginger ale. This entry was posted in England and tagged Britain, cucumber, drink, England, lemon, mint, orange, Pimm's, strawberries by Susanna. Bookmark the permalink.